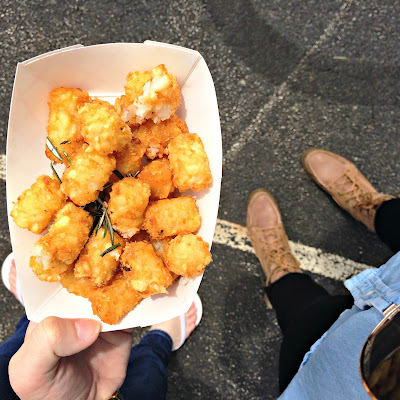 I learned of the Tallmadge Food Truck Festiva from a billboard next to the highway, because life is old-fashioned like that here in suburbia. 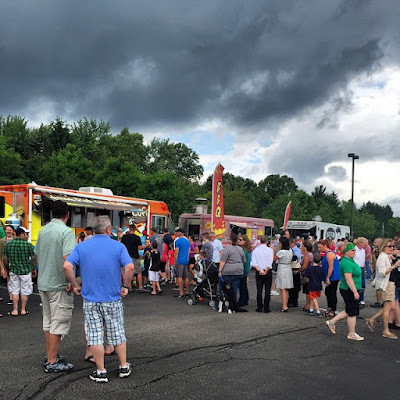 I looked forward to the event for about two months, literally counting down weekends until my friends & I could descend upon the nearby city of Tallmadge for its second annual gathering of a dozen or so food trucks in a rec center parking lot (because, again, suburbia). Of course, as is so often the case on the day of exciting outdoor events, the forecast for the day was rain, rain, rain - like, all day long - but the skies were clearish on Sunday morning, so we set off as planned. Parking was a nightmare, with nearly every spot full in the nearby high school lot, so my friends & I parked in makeshift spots on the grass approximately three quarters of a mile away from the big event - & then we trekked through a muddy field to get to it. Ominous, I know, but we are young & dumb & hungry. 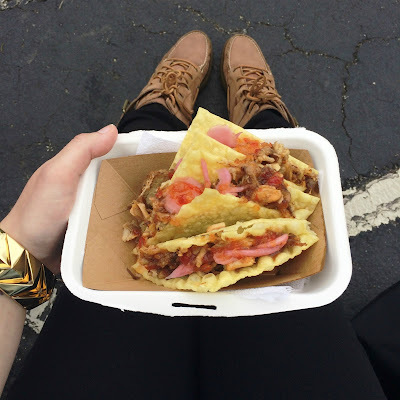 Next up was a trio of pulled pork wonton tacos topped with pickled onions & Thai chili sauce from Umami Bites, a Wooster-based truck. Important question: WHY WAS THERE NEVER A LINE FOR THIS TRUCK? We actually got these tacos twice because we didn't want to wait in other lines & these were delicious enough to warrant a second round. Everyone else was sleeping on these! As we sat on a curb & consumed round two of aforementioned tasty tacos, a photographer from the Tallmadge Express took our photo from afar & approached to ask for our names for publication. Local celeb status, right here! Except, uh, the photo doesn't seem to have appeared anywhere, much to my sadness. Luckily, there was a lobster roll to cheer me up. 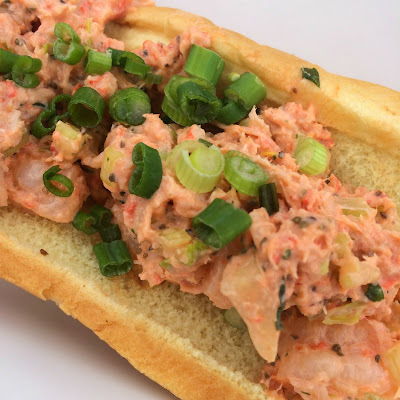 If I'm being honest, I have a difficult time referring to the above sandwich from the Manna Food Truck as a lobster roll, if only because my time spent living on the border of New Hampshire & Maine taught me a thing or two about what to expect of lobster-based handhelds. Don't get me wrong, this was a pretty tasty meal, as seafood salad sandwiches go, but I don't know that it deserves the title of "lobster roll" - or the $12 price tag. 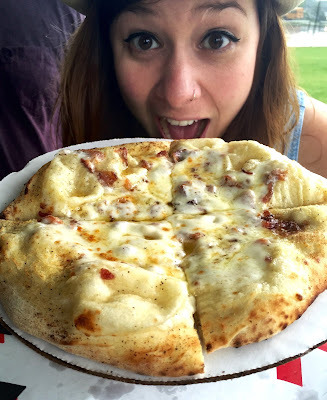 As I finished up my lobster roll, we waited on wood-fired bacon & honey pizza (!!!) from the Fire Truck Pizza Company, a food truck based out of (OK, I guess the name gives it away) an actual old fire truck. And then, just as we received our pizzas, the sky opened up, & it started to rain pretty hard. Like, really hard. Hard enough that we squeezed underneath a tiny tent with 100 or so other people & hoped for the best. Hey, at least we had pizza to keep us happy? But it kept raining & raining & raining. It just wouldn't let up, except for a very brief respite after we finished our pizza, which we used as an opportunity get gourmet popsicles. We were already pretty wet by that point, but we still held onto hope that it the rain was juuuust about to finish up. Alas, it wasn't to be. Strawberry rhubarb popsicles acquired, the rain reappeared, & we retreated to the cover of a sturdy building awning, where we remained relatively dry for about 20 minutes... until it began to rain sideways. Immediately soaked, we decided there was no use in trying to wait it out, & as others ran for the cover of flimsy tents, we finally accepted our fate - our very, very wet fate. Remember how I said we'd parked a solid distance away? Across a field? Let's just say that it was a long, damp trip back to our cars, & that wearing Sperry boat shoes does you no good when your boat capsizes, so to speak. Truly, we could not have been any wetter if we'd jumped into a swimming pool. But you know what? It was an adventure. A soggy, sort-of-stressful, muddy adventure. A little rain never hurt anybody, & for a stomach full of city-level food truck cuisine, it was absolutely worth it - or at least it feels that way now that I'm finally dry again!